In my CB Passive Income review, I'd like to clear up misconceptions. Can you make money just by joining and learning a few tips? Of course not. Is it legit or scam? Of course legit. Would I recommend it? Yes, but not to everybody. The first thing I can tell you is this. 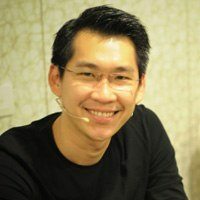 In the past few years of my solo ad traffic business, Patric Chan's sales funnels are most used by my clients. It means I have sent tens of thousands of visitors to my clients' landing pages ready-made by Patric, all of which seemed to do with CB Passive Income. Some of the repeat clients would give me a feedback saying they've made some sales, which made me think this system must be pretty decent? In this review I'll be as unbiased as I can, because I've seen some pretty negative reviews and I think they're missing the point. CB Passive Income - How Does It Work? #1 "It won't send traffic to your site!" Upon joining, you are provided with several pre-made landing pages with free product offers. You are going to promote your landing page(s) via social media, YouTube, by advertising on Bing, or by using paid traffic services. You can advertise multiple landing pages at the same time. Visitors will have to subscribe to your mailing list in order to receive the free product. Patric will send followup emails (newsletters) to your subscribers. They contain some selected product offers from an affiliate network, Clickbank. When your subscriber buys a product, you'll earn a commission. This is good for those who don't know how to create a landing (squeeze) page and thank-you page ("thank you for signing up with me!" page). A free product offer plays an integral part in generating leads. More visitors will sign up with you when a freebie is offered in return. Normally you'd have to create your own ebook or find a license free product elsewhere. With CBPI, your landing pages offer downloadable products such as "The CPA Cash Machine" and "The Affiliate Content Profits", all created by Patric. After they sign up with you, a download link to the free product will be emailed to them automatically, so you won't have to do anything. Great for those who have no idea how to write email followups and when to send. Not only you don't have to do anything because Patric will do it for you, but you can also steal his copywriting technique. You need to advertise your landing page yourself (see below) to collect subscribers, but once collected, they are yours. Patric will send email followups for you, but you can also send them yourself and promote other affiliate products. You need to sign up with a third party email marketing service though - AWeber or GetResponse is recommended. Similar to #3 above, if you are new to internet marketing, you'll get to learn the most optimal way to run a campaign, i.e. how a sales funnel and email marketing work. Everything you've learned from CB Passive Income will be useful in the future - when you start building your own website and promoting other affiliate products all by yourself! Two criticisms of CP Passive Income that I've found, which I don't necessarily agree. Everything else may be "done for you" by Patric, but you have to make an effort to drive traffic to your site, which is the hardest part. Then it's useless, most of the negative reviewers say. What do they expect, CB Passive Income to send free traffic to its members' sites? No one ever sends out visitors for free, such a magic service never exists anywhere on the internet. By advertising - via social media (free), via YouTube video posts (free), or pay to advertise. CBPI is not for content marketers. It is for people who want to make money but don't want to take the option No. 1; having to learn how to write good articles, having to publish many posts, and having to maintain the website Google friendly. Then the only other option is No. 2. It means they need to focus on how to advertise on social media, YouTube, and how to use paid services. Patric Chan provides training for each of these areas of No. 2 and does his best as he can to make things easy for the users. If you seriously think of a better way to improve the system, suggest it to him, he'll listen to you as long as your idea is constructive. The only way for an affiliate marketing newbie to make money quickly is to spend money. Merely posting your website url on social media is not at all effective and, broadcasting on YouTube also requires SEO technique. If you want to see the results in a matter of a few days, the only way to drive traffic is to use a reputable solo ad vendor. The cost varies, starting from around $35 per 100 visits. I don't believe in product reviews that simply disapprove upsells, just because they're advertised in your face and it's annoying. In fact those reviewers are not understanding the effectiveness of cross-selling in seller's point of view. They should be reviewing the value-for-money of upsells, not be criticizing the existence of upsells or number of them. CB Passive Income offers 3 upsells; "Inbox Pro Version" ($97), "Mass Bot Profits" ($99) and "Internet To Income Insider" ($100 per month). I haven't tried any of them myself and I can't say for sure, but Inbox Pro Version particularly sounds good to me. As explained above, your list of subscribers sits in your CBPI platform and emails will be sent out automatically in Patric's name. You can also send out your own followup emails to the same subscribers using a third party email marketing service. But the problem is not many email marketing service providers allow you to import a list of subscribers freely for anti-spam reasons. So Inbox Pro Version will come in handy. When someone signs up with you, their email address is added to both your CBPI list and your other list at the same time automatically. (NB: this does not change the fact that you'll be duplicating your list, i.e. considered spamming). $97 sounds pricey but it will be worth it if you're looking to build your list aggressively. If you choose to buy the lifetime version of CB Passive Income (see below), this is included in the price of $497. $47 per month or $497 lifetime (incl. Inbox Pro Version). As I mentioned earlier, you can't expect much by just advertising your site via social media or YouTube, unless you already have many responsive followers. Inevitably you need to spend on Bing ads or solo ad traffic. If you find a reputable traffic provider from Udimi and choose to pay $250 for 500 clicks ($0.50 per click), you'll receive around 50% opt-ins, meaning you'll collect 250 subscribers. More or less. There are some vendors who sell for as low as $0.35 per click, but they're generally not as good, so don't go too cheap. As I said, the figures are just examples so you can expect even better or worse, depending on the quality of solo ad traffic you receive. Again this is just a guess work, but if you set the monthly goal this way (e.g. $310 is the minimum commission total you'll have to make in order to break even), then this will be feasible. And don't forget, if you have your own autoresponder, you can try promoting other lower-ticket products to those who were never interested in Clickbank products offered by Patric previously. 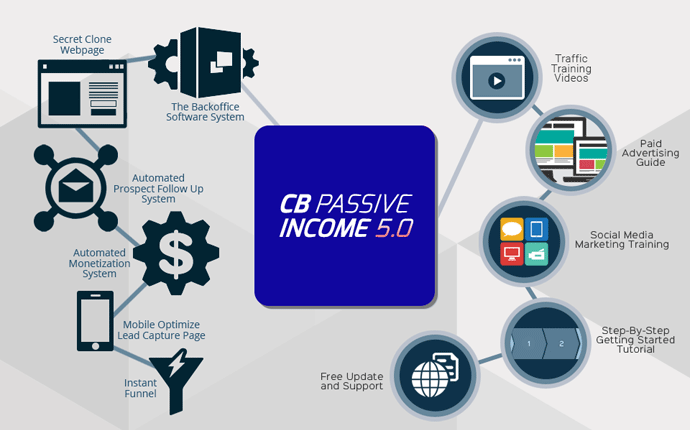 CB Passive Income has been around for 6 years now and it's on version 5, showing the system is pretty established and it's continuously improving. On the other hand, more and more people will know about this system and it may be saturated one day. Means it may become harder to find new buyers. For example people who already know about the freebies from Patric Chan may no longer be interested in buying whatever that's been offered by CBPI? Who knows, but it will be around for a few more years at least for sure. If you're not happy, you can claim 100% of your money back within 30 days. It's particularly useful if you already have your own email marketing service. Buy some more traffic and build your list, give your best shot and if you're not seeing good results, you can ask for a refund. The creator, Patric Chan is reputable. Beginner friendly. Along with training, opportunity to 'steal' Patric's technique. Subscribers list will be yours, yet you don't have to send email followup. No organic traffic (not for content marketers who are willing to learn SEO). Not for those who want to build their own niche marketing. No control over email followups. "Lifetime commission" is a little exaggerated. You'll only be receiving monthly commission while your referral's paying.